Despite Brazil’s storied history in the sport, Brazilian football teams are underdeveloped compared with other countries’ teams, especially those from Europe. Much of Brazilian football’s abundant revenue potential lies in ticket sales and fan support programs. To capture this revenue, the country's elite clubs must form a strong, long-term football league whose goal is to develop the sport and the businesses associated with it. Brazil’s main football clubs must also relinquish the existing associative club model in favor of a mixed-capital model that includes the club association and private investors. Brazil has a distinct place in football worldwide, having won five World Cups and produced dozens of creative players, including the incomparable Pelé. Yet despite their country’s storied history in the sport, Brazilian football teams are underdeveloped compared with other countries’ teams, especially those from Europe, where football has become big business. Exactly what is preventing Brazilian football from reaching its full potential as a sector, a sport and a form of entertainment? Where should clubs focus their efforts to ensure they can compete successfully with other large but better-equipped teams? Simulations indicate that Brazil’s main football clubs could triple or quadruple their revenues (see Figure 1). In 2016, the Brazilian championship clubs’ revenues totaled USD 1.1 billion. 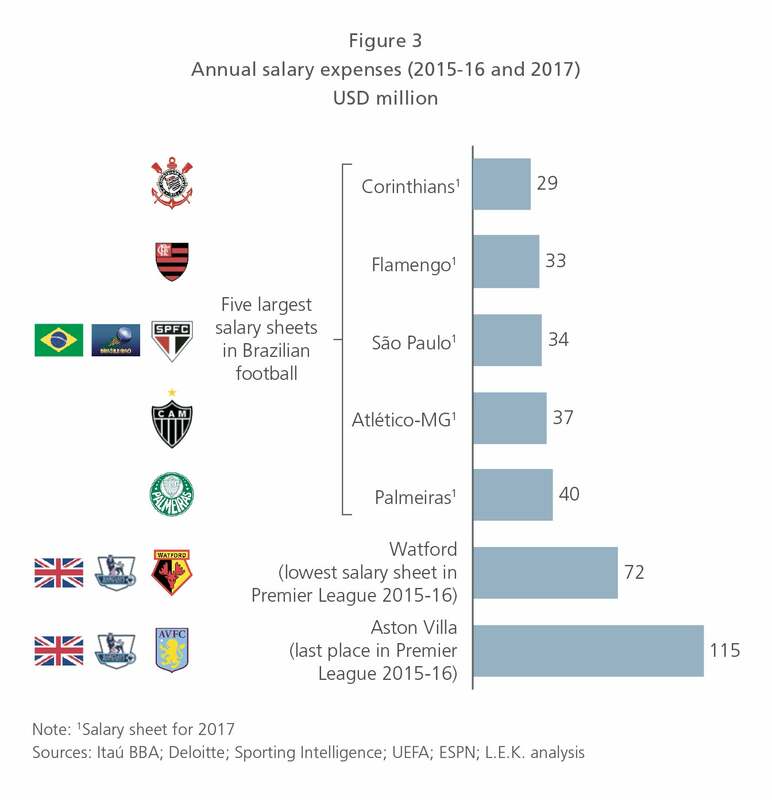 If football’s weight in Brazil's GDP were similar to its weight in Europe's reference countries, Brazil's elite club revenues could exceed USD 3.5 billion. Much of Brazilian football’s revenue potential lies in ticket sales. During the 2017 Brazilian football championship, for instance, only 41% of tickets were sold in comparison with 96% and 92% of tickets sold for the Premier League (UK) and for the Bundesliga (Germany), respectively. The average number of tickets sold during the 2017 regular season in Brazil was 16,000, which is well below the number of season tickets sold for Premier League and Bundersliga matches (36,500 and 43,200 tickets sold, respectively). How can Brazilian football clubs become more competitive internationally? In order to capture Brazilian football’s immense revenue potential, the country's elite clubs must form a strong, long-term football league whose goal is to develop the sport and the businesses associated with it. In countries where clubs generate significant revenue, leagues comprise elite clubs, with some involvement from other important players, such as sports associations and the public. Without this “league mentality,” Brazil won’t be able to elevate its football clubs’ status. The predominant associative model hampers long-term sustainable development. Virtually all football clubs in Brazil are associations owned by their members. This associative model establishes incipient rules of accountability for managers, impairing accountability in management. In addition, the presidential mandate system (in which presidents are typically elected for mandates of two to three years) hinders the planning and execution of long-term actions because it often meets fans’ and the electoral college’s desires before anyone else’s, thus damaging a club financially in the long run. The football business and the clubs typically have different agendas, thereby complicating the management and development of football. In fact, even in years when there has been a large share of non-recurring line items in clubs’ revenues, clubs have taken few actions aimed at sustainability over both the medium and the long term. For example, in 2016, clubs received a cash injection of approximately USD 215 million in future television rights. They used nearly half of that money to acquire athletes instead of reducing bank debt to private creditors. Elite clubs have poor financial performance. This is particularly true when comparing these clubs to elite clubs in other countries. 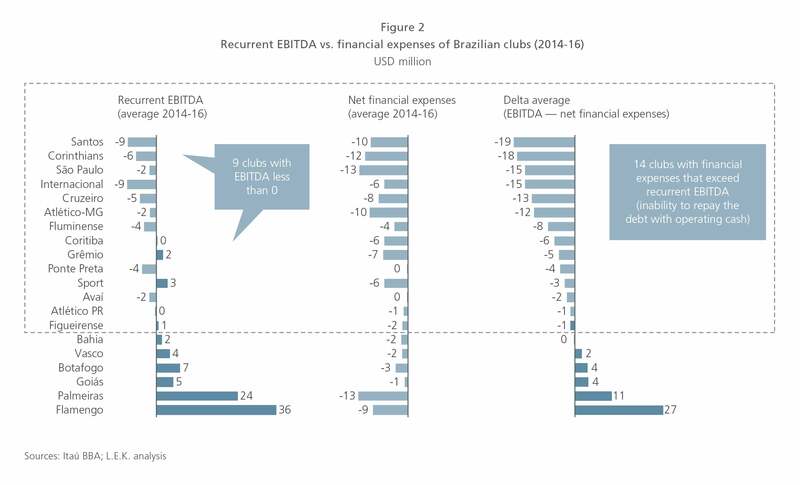 In the past three years, only six of the 20 largest Brazilian football clubs achieved average recurrent EBITDA higher than their average financial expenses (see Figure 2). That is, 70% of the largest Brazilian clubs have not generated enough recurring operating income to cover the interest on their debts, a scenario that can be aggravated by an increase in financial obligations. It is important to note that approximately 55% of clubs’ debt is with the government, due to the delay in payment of taxes and fees. If it weren’t for significant debt forgiveness (totaling approximately USD 180 million in 2016) and its extension through the Program for Modernization of Management and Fiscal Responsibility of Brazilian Soccer (Profut), many clubs would be in a much more dire financial situation. As a result of high indebtedness and poor operating results, clubs cannot easily pay competitive wages to retain talent. Palmeiras currently has the country’s highest payroll, at approximately USD 40 million annually, while the lowest payroll in the European Premier League in the 2015-16 season was approximately USD 72 million (see Figure 3). In order to achieve internationally competitive remunerations, the 20 main Brazilian teams would need a total cash injection of USD 0.6 billion to USD 1.2 billion per year. A new model that addresses ownership, governance and management would solve the problems arising from the current associative model. This new model would emphasize the importance of attracting capital to the clubs, thereby increasing their financial strength and decreasing the distance between their revenues and those of other countries’ clubs. The model would create a virtuous cycle of improvement in Brazilian football. In the new model, all activity related to football would be separate from social aspects of the sport and converted into a company called Futebol S.A. The association, i.e., the club’s members, would be a relevant shareholder of the club company, opening space for private investors to make capital contributions and thus also be shareholders of the company. Therefore, Futebol S.A. would be characterized as a mixed-capital corporation, with the participation of both the association and private investors, and decisions would follow the mechanisms of deliberation and approval typical of company administrative boards. Regardless of the association's share of the capital, it would require veto power over decisions related to club tradition, such as altering the club's visual identity, changing the anthem, changing cities, using symbols, etc. Futebol S.A. would have full-time, appropriately compensated executives dedicated exclusively to their positions. This structure would enable the collection of data on management’s effectiveness and would establish accountability. The chief administrative officer would be a CEO chosen by the board of directors, and the criteria used to select investors and executives would be based on good corporate governance practices. Using other countries’ clubs and leagues as a reference in terms of organization, financial results and technical quality, private investors are part of the model in 90% of the clubs that participate in their respective first divisions (see Figure 4). 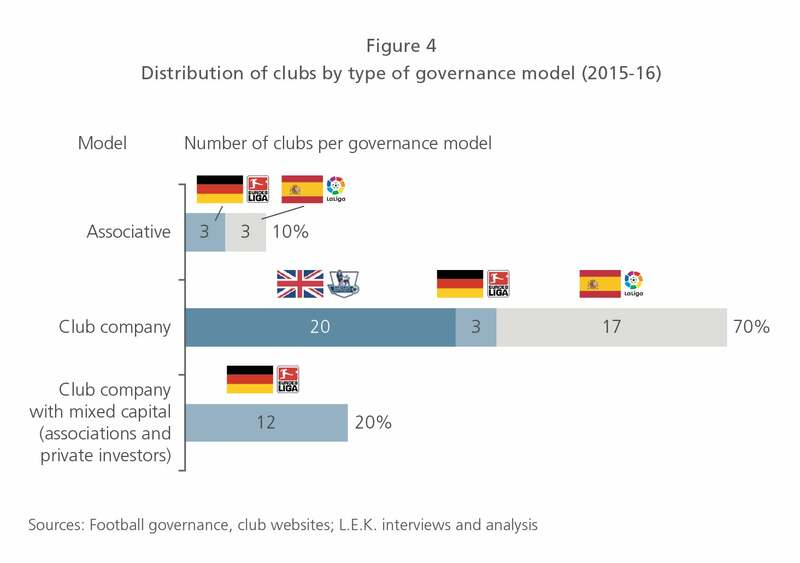 It is interesting to note that in Germany, football clubs with mixed capital are predominant, and rules prevent private investors from holding a controlling position. Recently, a debate has started in Germany to review this restriction on the participation of private capital in the country's clubs. The reason for this is clear: The German league wants its teams to remain competitive with other European league teams, some of which (e.g., the Premier League’s Chelsea and Manchester City) receive substantial capital from private investors. Even with the possible review of this restriction, measures are being discussed among German clubs to maintain their tradition, such as the right to veto items related to a club's culture, (e.g., changes in the color of the shirts or the location of the stadium). Using other leagues as a reference, and understanding the challenges Brazilian clubs face, it becomes clear that in order for Brazilian football to thrive as a sector, a sport and a form of entertainment, the country’s main football clubs must relinquish the existing model in favor of a mixed-capital company club model that includes the participation of the club association and private investors. 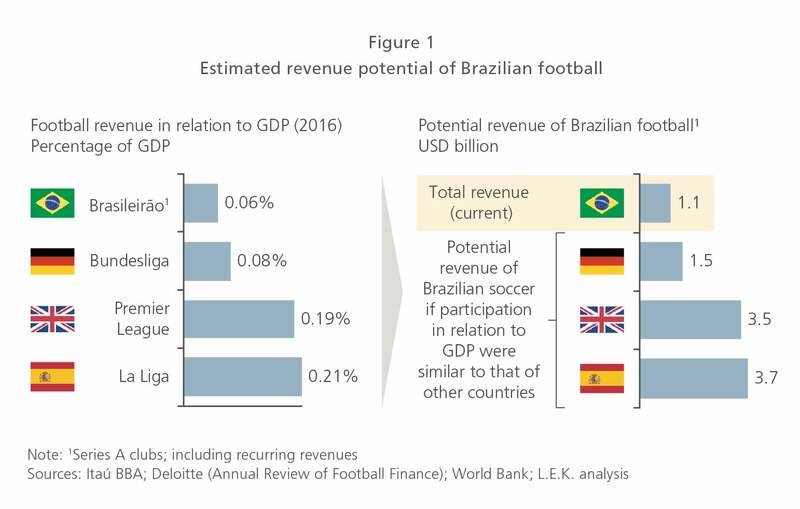 This change in model would be a fundamental step toward starting a cycle of virtuous transformation that would allow Brazilian football to improve in terms of both revenue and international competition in just a few years. Without this change, Brazilian teams’ potential will never be realized, and the country’s best players will continue to flourish in the better-equipped European leagues.